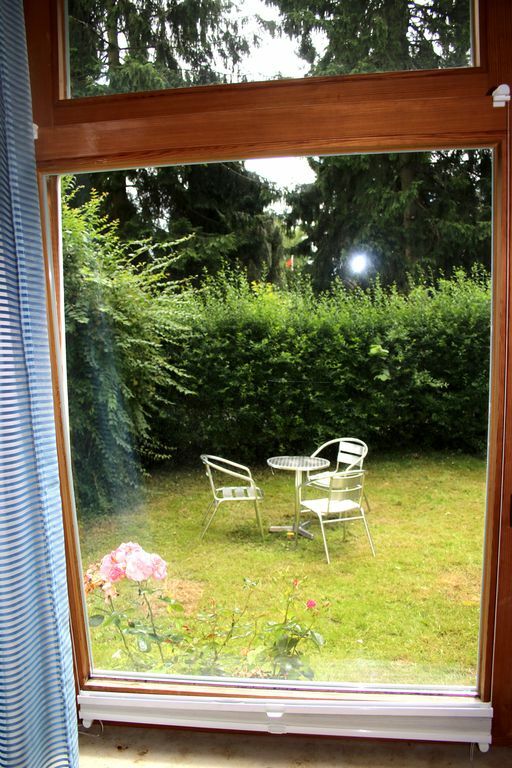 A beautiful and quiet ground floor apartment, in green surroundings in the north of Hamburg. Ideal for business travelers and tourists due to the proximity to the airport and the direct train connection to the city. Within walking distance, about 5 minutes, you can easily reach the "city center" with the S-Bahn and shops for your daily needs. We look forward to seeing you! The entire apartment is at your disposal. A spacious living room with a large sofa bed overlooking the garden, a cute kitchen and a cozy bedroom. The beautiful south garden invites you to linger, relax and play. You can reach the train station (S-Bahn) within 5 minutes on foot; Next to the train station you will find a grocery store, post office, restaurant, bakery, ice cream and cafes and a bank. It takes about 20 minutes to reach the main train station and to be in the center of Hamburg. You are just 2 stops away (about 10 minutes) from the airport and only 7 minutes to a large shopping center called AEZ. If you are a nature or jogging lover, you will find the well known ALSTERWANDERWEG just a block away, where you can take a nice walk to admire the nature and the Alster River. There are also many playgrounds for the kids.